Only the Choicest of Wine – What’s Best for Kiddush and Arba Kosos? Yankel enters my study, with one of his inquisitive looks on his face. Knowing that Yankel likes very complete explanations, I prepared myself for a lengthy conversation. The Gemara (Bava Basra 97b) quotes the following discussion: Rav Kahana asked Rava “May one use chamar chivaryin, white wine.” Rava answered him by quoting a pasuk in Mishlei (23:31), “Do not pay attention to how red your wine becomes,” (meaning focus your life on permanent, spiritual values and not on the transient and physical). The pasuk implies that the redder the wine, the better its quality. This Gemara, which is discussing the requirements of wine for kiddush and other mitzvos, implies that one may not use white wine for kiddush, and indeed this is the way the Ramban rules (ad loc.). However, Rashbam concludes that the Gemara is discussing only whether white wine is kosher for nisuch (libation) on the mizbeiach, but it may be used for kiddush. Others reach the same conclusion that our white wine is acceptable for kiddush, but for a different reason. They contend that the Gemara is not discussing quality white wine, but inferior wine that has no color at all (Tosafos). (White wine is always light-colored or yellowish.) According to this opinion, quality white wine is acceptable even for the mizbeiach. The halacha is that one should preferably use a red wine unless the white wine is better quality (Rama 472:11; Mishnah Berurah 272:10). At the seder, there is an additional reason to use red wine, because it reminds us of Pharaoh’s slaughter of Bnei Yisroel (Mishnah Berurah 472:38). Therefore, if one chooses to use white wine, some suggest mixing red wine into the white wine to give it a little red color (Piskei Tshuvos 472:10). When mixing the wine, it is preferred to pour the red wine into the cup first and then add the white. If one adds red wine to white wine he will color the white wine, which is prohibited on Shabbos and Yom Tov according to some poskim because of the melacha of tzove’a, dyeing or coloring (see Mishnah Berurah 320:56). Cooking wine harms it, and cooking grape juice affects its ability to ferment naturally. Indeed, some winemakers never pasteurize the juice from which they produce their wines because heating compromises the taste. For these reasons, halacha views wine that is mevushal as inferior, and this has several ramifications. The prohibition not to use wine touched by a gentile, stam yeinam, does not exist if the wine was mevushal before the gentile handled it (Gemara Avodah Zarah 30a). This is because no self-respecting idolater would consecrate cooked wine to his deity (Rambam, Hilchos Maachalei Asuros 11:9; cf. Rosh, Avodah Zarah 2:12 who explains the halacha somewhat differently). Similarly, one may not pour cooked wine as a libation for a korban. Some poskim contend that mevushal wine is so inferior that one does not recite hagafen on it but shehakol, and that it is invalid for kiddush and arba kosos (see Tosafos Bava Basra 97a s.v. ileima; Tur Orach Chayim, Chapter 272). Although we recite hagafen on mevushal wine and rule that it is kosher for kiddush and arba kosos (Shulchan Aruch 472:12), one should try to use uncooked wine unless the mevushal wine is superior (Rama 272:8; Mishnah Berurah 472:39). There is one situation where one must use mevushal wine, and that is when gentiles might handle open bottles of wine. This is why most hechsherim insist that all wine served in restaurants and at catered events be mevushal. Incidentally, almost all bottlers in North America pasteurize their juice before bottling. Commercial pasteurization of juice products is usually at about 180° Fahrenheit. BUT I HEARD THAT PASTEURIZATION DOES NOT NECESSARILY EQUAL BISHUL? The early poskim state that heating wine until it begins to evaporate makes it mevushal (Shach, Yoreh Deah 123:7, quoting Rashba and Ran). How hot is this temperature? Rav Moshe Feinstein ruled that 175° Fahrenheit is definitely hot enough to be considered mevushal (Igros Moshe, Yoreh Deah 2:52; see also 3:31), although some poskim contend that wine must be heated to a much higher temperature (see Darchei Teshuvah, Yoreh Deah 123:15; Minchas Shlomo 1:25). Because of this dispute, some hechsherim rule that only wine and grape juice that is heated until boiling is considered mevushal, whereas others consider all commercially available grape juice as mevushal. However, some poskim contend that the laws of mevushal wine do not apply to contemporary pasteurized juice since the processing is made in a way that the wine does not taste inferior (Shu”t Minchas Shlomoh 1:25). Thus, one could use wine made from pasteurized juice or pasteurized juice without any concern, but one should not use wine that was cooked after fermentation which definitely tastes inferior. According to this opinion, a gentile touching pasteurized wine or grape juice will make it prohibited. One may use freshly pressed grape juice for kiddush, even though it contains no alcohol (Gemara Bava Basra 97b). However, one should preferably not use grape juice for the seder as I will explain. 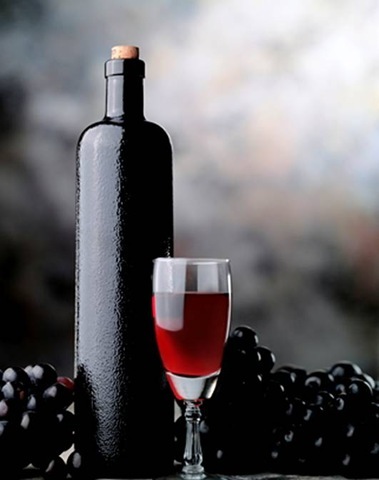 In the time of the Gemara, wine was so strong that people diluted it with three parts water (per one part wine) before using it for kiddush and other mitzvos. The Gemara teaches that someone who drank the wine without dilution fulfills the mitzvah of drinking four cups of wine, but does not fulfill the mitzvah of cheirus, freedom (Pesachim 108b). This is because the complete mitzvah of arba kosos requires drinking wine with a pleasurable amount of alcohol. This undiluted wine is too strong and not pleasurable. We derive from this Gemara that wine is better for the seder than grape juice, because the alcoholic content of the wine provides the element of cheirus. However, someone who cannot drink wine may fulfill the mitzvah of arba kosos with grape juice. Reconstituting grape juice involves evaporating at least 80% of the water that is naturally part of the juice, and then later adding water back. (Juice is concentrated and then reconstituted because it saves tremendous amounts of shipping and storage costs, and because the concentrate has a longer shelf life.) It is important to note that the concentrate is not drinkable before adding water. Grape juice does not have all of these qualities since it does not contain any alcohol. However, since it can potentially become wine, it merits the special bracha of hagafen and may be used for kiddush. Rav Shlomo Zalman posed the following question: Do we consider natural grape juice as a mixture of the tasty part of the grape and plain water, or do we make no distinctions and consider grape juice as a mixture of everything inside the grape? Obviously, everyone will conclude that grape juice is what grows inside the grape. Although natural juice is over ninety percent water, the water that grows inside the grape is considered grape juice, not water. However, water added to concentrate does not metamorphose into juice but remains water. Thus, he rules that the finished product is concentrate mixed with water and not pure grape juice. “Good question,” I responded. “However, Rav Shlomo Zalman points out that the concentrate may not be considered grape juice since during the processing it becomes undrinkable. Therefore, the juice is no longer a prize beverage that warrants its own unique bracha, nor can it potentially become wine. This is why Rav Shlomo Zalman conjectures that even after the juice is reconstituted, its bracha may be shehakol, not hagafen (Minchas Shlomoh #4). Although some poskim disagree with Rav Shlomo Zalman’s conclusions, it is advisable not to use reconstituted juice for kiddush and arba kosos (Shu”t Minchas Yitzchok 8:14; ViZos HaBeracha pg. 116; Piskei Tshuvos, 272:2). “Answering this question requires an introduction,” I responded. Someone who brings out a new bottle of wine in the middle of the seder should technically recite the bracha of hatov vehameitiv. However, many poskim contend that reciting an extra bracha on a cup of wine makes it appear that one is adding another cup to the four that Chazal instituted (Maharil, as explained by Mishnah Berurah 175:2). Therefore, they ruled that one should not bring out a new variety of wine during the seder meal. Yankel prepared to leave. “So which wine is choicest?” I asked him. Previous Previous post: Do I One or Two? — What Determines Whether One Observes a Second Day of Yom Tov?